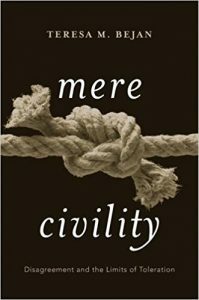 Discussion with Teresa Bejan of Oriel College, Oxford about her 2017 book Mere Civility, which contrasts the views on the limits of toleration in a liberal society of John Rawls, Thomas Hobbes, and Roger Williams, and defends Williams’ ‘mere civility’ which was based on “mutual contempt” rather than mutual respect. We also discuss recent events at Middlebury and Wellesley College, identity politics’ want for epistemic humility, and ‘free speech fundamentalism’. For more on Mere Civility, see this recent New York Times feature.